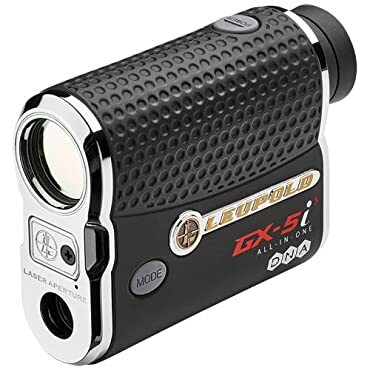 Leupold GX 5i3 RangefinderFaster, More Accurate, VersatileA RangefinderThe Leupold GX 5i3 golf rangefinder provides faster, more accurate readings in a versatile package. This new rangefinder provides club selection recommendations based on your hitting strength, slope and current environmental conditions for a more accurate reading. This feature can be turned off to make the unit tournament legal. PinHunter 3 Laser Technology is faster and easier to use than ever while Prism Lock Technology audibly lets you know you're locked on target.Leupold GX 5i3 Rangefinder features: * PinHunterA 3 Laser Technology picks up the flag even faster and easier * Prism Lock TechnologyA uses highly reflective prisms for the most accurate readings * Leupold high performance DNA (Digitally eNhanced Accuracy) engine and advanced laser measures faster with greater accuracy to the nearest 1/10 of a yard * TGR and Club Selector provides accurate distances and club recommendations based on hitting strength, slope and environment that can be disabled for tournament play * Fog mode helps cut down on false readings * 1-Touch Scan Mode makes use easy * 3A selectable reticles * Range capabilities: 450 yards to the pin, 800 yards reflective * Completely waterproof construction * Cordura case included * Line of sight distance is USGA legal * CR2 lithium battery included * 3.8" LA x 3.0" H A x 1.4" W * 7.8 oz. The GX-5i3 with Leupold's high performance DNA (Digitally enhanced Accuracy) engine and advanced infrared laser provides faster measurements and increased accuracy displayed to the nearest 1/10 of a yard. Featuring TGR and Club Selector, which can be disabled for tournament play per updated USGA rule 14-3, the GX-5i3 provides ranging information and club recommendations based on personal hitting strength, slope, and current environmental conditions.